Seven outfits worn by Margaret Thatcher during the 1970s in the early part of her career are being auctioned at Christie’s on Monday. They form part of its London Sale, which is being held to celebrate the Queen’s Diamond Jubilee and London 2012. 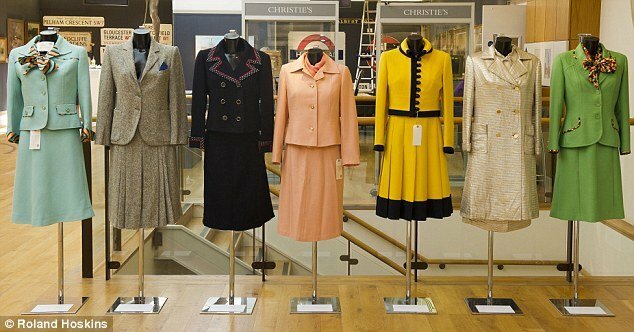 Sold by a private collector, the suits which come in an array of colors, are thought to be the first of Lady Thatcher’s clothes to be sold at a public auction. All of the Iron Lady’s outfits have been given a guide price of between £1,000 ($1,600) and £1,500 ($2,500). She said she was not aware of any previous auctions of Lady Thatcher’s outfits. Last year Lady Thatcher’s black Asprey rectangular leather handbag sold for £25,000 ($39,000) at auction. She was said to deploy it to enforce cabinet solidarity. The term “handbagging” was used as a reference to the way she disciplined unrurly Tory backbenchers and ministers during her years in Downing Street. This was worn to the Conservative Party conference in 1975 and Lady Thatcher can be seen wearing it in contemporary news footage, standing alongside Edward Heath on the conference platform. Margaret Thatcher can be seen in the navy suit during a Valerie Singleton programme. This outfit she wore while being grilled about moisturiser by Sue MacGregor in 1971. This was worn when she was confirmed as the new leader of the Conservative Party . Margaret Thatcher is seen wearing the navy suit in an episode of Val Meets the VIPs, which was presented by Valerie Singleton. Margaret Thatcher wore the green suit in a 1972 edition of Panorama called Women in Politics.